Scientists in South Korea have developed solar cells thin enough they can be bent around a pencil. The cells, which were announced on Monday, could help usher in the use of solar energy in small portable gadgets where space is at a premium. 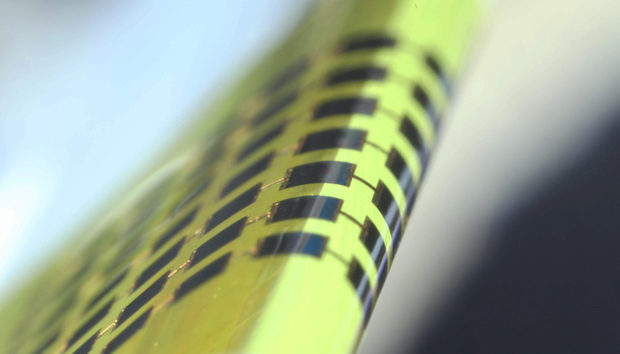 The cells are fabricated onto a flexible substrate that is just a micrometer thick -- one-half to one-quarter the thickness of other "thin" solar cells and hundreds of times thinner than conventional cells. A human hair, by comparison, is about 100 micrometers. The team at the Gwangju Institute of Science and Technology in South Korea managed to reduce the thickness by directly attaching the cells to the substrate without the use of an adhesive. They were stamped onto the substrate and then cold welded, a process that binds two materials together through pressure, not heat. The scientists tested the cells and discovered they can almost be folded in half -- wrapped around a radius as small as 1.4 millimeters. A paper describing the work was published on Monday in Applied Physics Letters, a journal of the American Institute of Physics. Solar cells are commonly used as power sources in several types of large electronics, but their use on consumer items, such as gadgets and even cars, has been limited. That's in part because of the smaller area available to mount the cells and the fact that such products often have numerous curved surfaces. The new panels could overcome those limitations.